First we had Rise of the Planet of the Apes, then Dawn of the Planet of the Apes, and naturally the next logical step is War, therefore the third film in this revamped Planet of the Apes franchise is called War for the Planet of the Apes. The begin credits of this third film does a pretty good job at giving an overview of what’s happened in this post-apocalyptic word up until this point, and they even have a stab at explaining why Rise came before Dawn (good try, but it still doesn’t make sense). 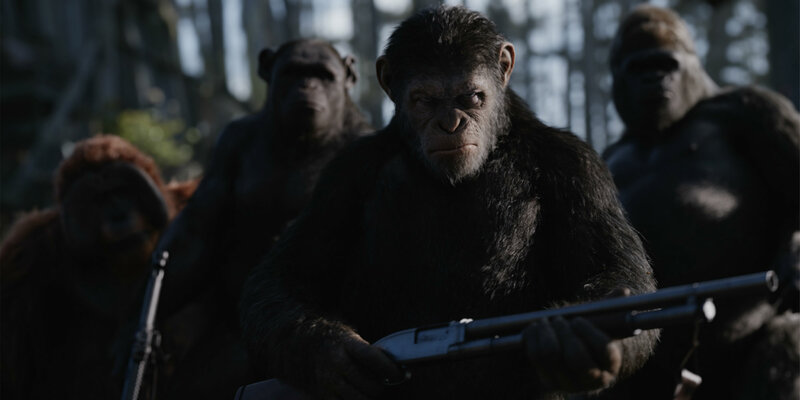 Matt Reeves is back in the director’s chair and Andy Serkis returns as the super intelligent Caesar, leader of the genetically enhanced tribe of apes. If you’re familiar with the previous films, you’d know that the events of Dawn of the Planet of the Apes resulted in a full-blown war between the humans and apes. Caesar and his tribe of apes are hiding out in the woods and being hunted by the US military group referred to as Alpha-Omega, who Gary Oldman’s character managed to make contact with at the end of Dawn. Alpha-Omega (AO for short) are led by a rather despicable and menacing man known only as the Colonel (Woody Harrelson). I did not start this war. I offered you peace. I showed you mercy. But now you’re here. To finish us off… for good. 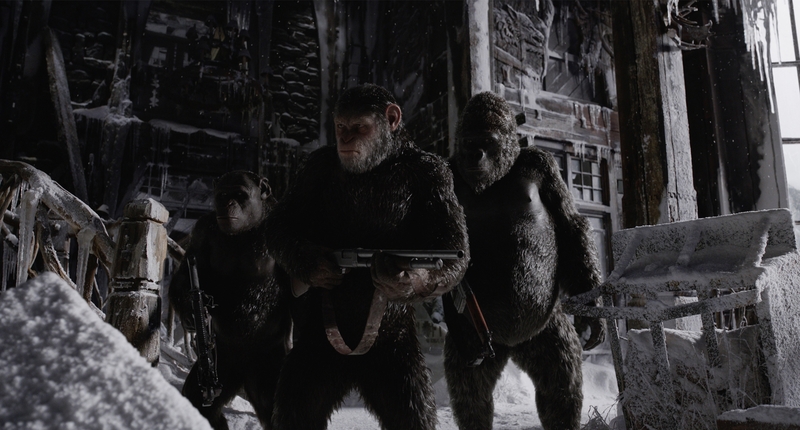 War for the Planet of the Apes starts off with the group of soldiers sneaking up on the apes’ wooded hideout. A battle ensues and it results in Caesar sending back the surviving humans to their base, which he hopes will deliver a message of peace to the Colonel. Unfortunately, the message was not well received, since Harrelson’s Colonel later infiltrates the apes’ makeshift home and murders Caesar’s son and wife. This then sends our favourite ape over the edge and he goes in search for revenge. 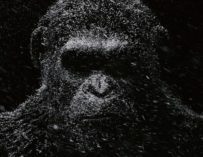 Matt Reeves has done something truly remarkable with War for the Planet of the Apes. Not only has he made a thoroughly entertaining blockbuster, but he’s actually managed to fill it with genuine emotion and pathos. Over the course of this Planet of the Apes trilogy, we’ve come to care for these apes. Due to the incredible advancements made in motion capture technology, we quickly forget that we are watching CGI animals on-screen. Caesar, Maurice and Rocket feel as real as any of the human characters, even more so in some cases. Reeves and Mark Bomback’s script offers an interesting juxtaposition between the apes and the humans. In many ways, the apes are displaying more human emotion than the humans. Caesar is a prime example of this. The murder of his family (although his youngest son does survive) sends him on a murderous rampage, and we see him do things he would have been horrified by in the previous movies. Over the course of these movies Serkis’ Caesar has always been the voice of hope, peace and diplomacy. We’ve heard him say on many occasions that he didn’t start this war, which is true. Koba and the humans can be blamed for that. Yet, in War for the Planet of the Apes, Caesar ditches all diplomacy and reason and goes in search for blood. Not only is this a captivating plot point, it also allows Serkis to really flex his acting muscles, of which he was many. If Serkis doesn’t get nominated for his performance as Caesar I’ve lost all hope in the people who decide these things (if I ever had any). Ape-Pocalypse Now meets The Last of Us! I did not start this war. But I will finish it. Serkis is pitted against Woody Harrelson’s Colonel, who’s yet another great villain in the Apes franchise. 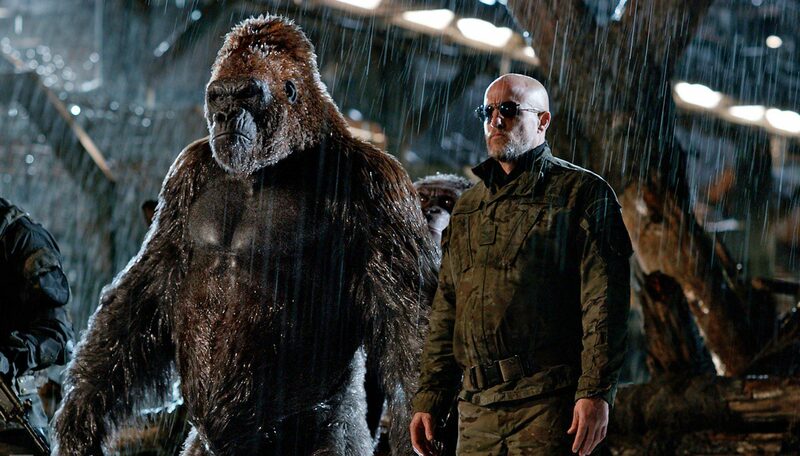 As a side note, it’s a real joy to see Toby Kebbell return as Koba, however fleetingly, who will probably go down as one of cinema’s unsung villains. The Apes franchise has yet another captivating villain in Harrelson’s Colonel. It must be said that he seems to be channelling Marlon Brando’s Colonel Walter E. Kurtz from Apocalypse Now, but who ever said that was a bad thing. To begin with the Colonel just seems like a complete mad man, but as you uncover more about Harrelson’s character, you start to understand the motives behind the insanity and can even empathise with him… to a certain extent. A lot of credit has to go to Harrelson’s, since without him the character could have ended up being slightly two dimensional. All of human history has lead to this moment. The irony is we created you. And nature has been punishing us ever since. This is our last stand. And if we lose… it will be a Planet of Apes. There’s also the addition of a new character who should not be forgotten. Steve Zahn plays an ape who refers to himself as Bad Ape. Caesar and co. meet along the way to Alpha-Omega’s military camp, and Bad Ape is another ape who was granted human-like intelligence thanks to the virus that wiped out most of the humans race. 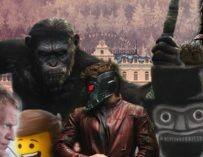 Bad Ape is particularly interesting since not only does he open up the possibility of more Planet of the Apes movies, but he also serves as some much needed levity. Zahn’s Bad Ape is wonderfully funny, yet also very tragic, however without him the film would have been a bit of a hard and depressing slog. Bad Ape in War for the Planet of the Apes. Human get sick. Ape get smart. Then human kill ape. But not me. I run. 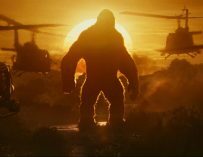 There are many comparisons to be made between War for the Planet of the Apes and Apocalypse Now. Some may want to call this culmination in the new Planet of the Apes trilogy Ape-Pocalypse Now, and they’d have a point. However, I thought this film had more in common with The Road or Naughty Dog’s critically acclaimed video game The Last of Us. It’s more of a road movie than a war movie. There are ‘war-y’ bits in it, especially in its final third, but it’s a much more personal tale for Caesar, which is as it should be since this trilogy has been about his story. 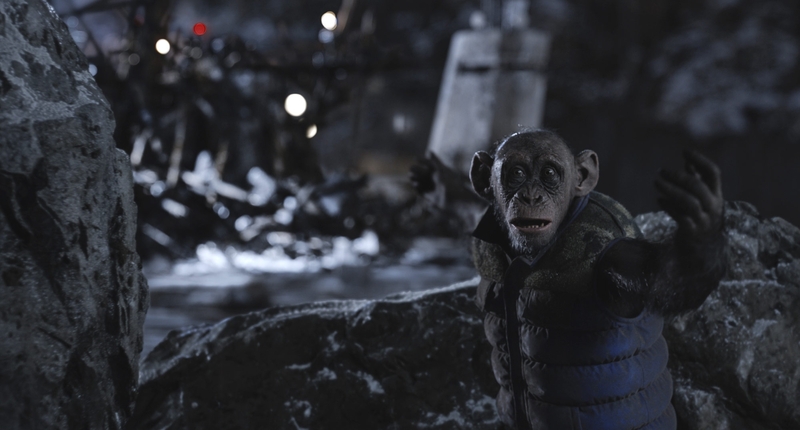 War for the Planet of the Apes is a perfectly fitting send off for Caesar and one which should go down in cinema history, as should Serkis’ performance.